Cardiothoracic surgery is the field of medicine involved in surgical treatment of organs inside the thorax (the chest)—generally treatment of conditions of the heart (heart disease) and lungs (lung disease). Cardiac surgery (involving the heart and great vessels) and thoracic surgery (involving the lungs) are separate surgical specialties, except in the United States, Australia, New Zealand, and in some EU countries, such as the United Kingdom and Portugal. Historically, cardiac surgeons in Canada completed general surgery followed by a fellowship in CV / CT / CVT. 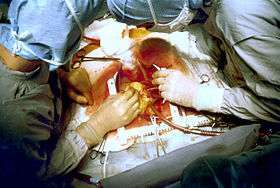 During the 1990s, the Canadian cardiac surgery training programs changed to six-year "direct-entry" programs following medical school. The direct-entry format provides residents with experience related to cardiac surgery they would not receive in a general surgery program (e.g. echocardiography, coronary care unit, cardiac pathology, etc.). Typically, this is followed by a fellowship in either Adult Cardiac Surgery, Heart Failure/Transplant, Minimally Invasive Cardiac Surgery, Aortic Surgery, Thoracic Surgery, Pediatric Cardiac Surgery or Cardiac ICU. Contemporary Canadian candidates completing general surgery and wishing to pursue cardiac surgery often complete a cardiothoracic surgery fellowship in the United States. However, the Royal College of Physicians and Surgeons of Canada affords a three-year cardiac surgery fellowship for qualified general surgeons that is offered at several training sites including the University of Alberta, the University of British Columbia and the University of Toronto. Thoracic surgery is its own separate 2-3 year fellowship of general surgery in Canada. In the UK, you have to train for an MBBS, typically for 5 years, and if you're doing a BSc as well, 6 years usually. After you apply for a specialty place, or core surgical training (which is less competitive than going straight into the speciality). If you go for the core surgical training, you can then apply on the third year for cardiothoracic surgery, which at that point is much less competitive. Once you're training for the speciality, you may choose to subspecialise in perhaps: aortic surgery; adult cardiac surgery; thoracic surgery; paediatric cardiothoracic surgery; adult congenital surgery. This is a rewarding and technically challenging speciality, similar to interventional cardiology in some aspects. Surgery in great vessels (aortic coarctation repair, Blalock-Taussig shunt creation, closure of patent ductus arteriosus) became common after the turn of the century and falls in the domain of cardiac surgery, but technically cannot be considered heart surgery. One of the more commonly known cardiac surgery procedures is the coronary artery bypass graft (CABG), also known as "bypass surgery." In this procedure, vessels from elsewhere in the patient's body are most commonly harvested using a procedure known as EVH, and grafted to the coronary arteries to bypass blockages and improve the blood supply to the heart muscle. Nazih Zuhdi performed the first total intentional hemodilution open heart surgery on Terry Gene Nix, age 7, on February 25, 1960, at Mercy Hospital, Oklahoma City, OK. The operation was a success; however, Nix died three years later in 1963. In March, 1961, Zuhdi, Carey, and Greer, performed open heart surgery on a child, age 3 1⁄2, using the total intentional hemodilution machine. In 1985 Zuhdi performed Oklahoma's first successful heart transplant on Nancy Rogers at Baptist Hospital. The transplant was successful, but Rogers, a cancer sufferer, died from an infection 54 days after surgery. ↑ "Portuguese Ordem dos Médicos - Medical specialties" (in Portuguese).